Two piece conti suit 07101 J54 230g cotton SABSEasy fitting long sleeve jacket with zipper * Breast pockets with flaps and stud closure * 2 Skirt pockets *Trouser with 2 side pockets * Hip and rule Pockets * Zip fly. Royal Blue / Navy Blue / Orange / Red / Emerald Green / White / Grey / Black.This is a durable lighter Conti suit made of two separate parts, the pants / trousers and the jacket, a two-piece style. This means it will cover your body from the neck down to your ank..
Artisan's work suit 04100 J54 230g one piece cotton SABS. 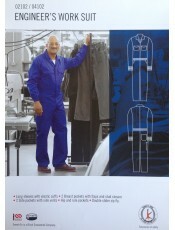 Long sleeve with hemmed cuffs * 2 Breast pockets with flaps and stud closure * 2 Side pockets with side vents * Hip and rule pockets * Button fly.Boiler suit / jump suit.This is a durable lighter overall in a one piece style. This means it will cover your body from the neck down to your ankles and wrists. 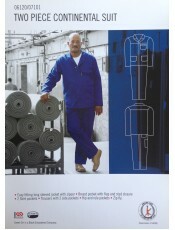 It comes in navy blue and royal blue colours this is a general purpose heavy duty cooler overall / boiler suit as it is made fr.. 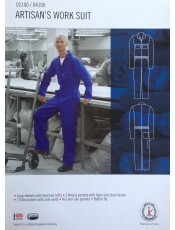 Engineer's work suit 04102 J54 230g one piece cotton SABS Long sleeve with elastic cuffs * 2 Breast pockets with flaps and stud closure * 2 Side pockets with side vents * Hip and rule pockets * Double slider zip fly.Orange / Navy Blue / Red / Royal Blue / Grey / Emerald Green / Yellow / WhiteBoiler suit / jump suit .. Jacket only Conti suit 07410 J54 230gm cotton SABS Easy fitting long sleeve jacket with zipper * Breast pockets with flaps and stud closure * 2 Skirt pockets ..
Trouser only Conti suit 07300 J54 230g 100 % cotton SABS 2 Side pockets with side vents * Hip and rule pockets * Double slider zip fly. ..